Most people agree that Hurricane Irma walloped the City of Miami last September, but it could have been so much worse. City officials and elected leaders have used words like “wake-up call” to characterize Hurricane Irma, as they praised city workers and volunteers for helping with emergency needs in the hours and days without electric power, and in the days and weeks that followed to rid streets of storm debris. The city government had emergency funds to ease the immediate pain, while noting from the start how important it would be to itemize the damages in order to earn eligibility of all-important reimbursement dollars from the federal government. In the early days after the storm, Christopher Rose, director of the Office of Management and Budget, said the city would be seeking FEMA (Federal Emergency Management Agency) reimbursement according to the Federal Stafford Act for most storm-related costs. 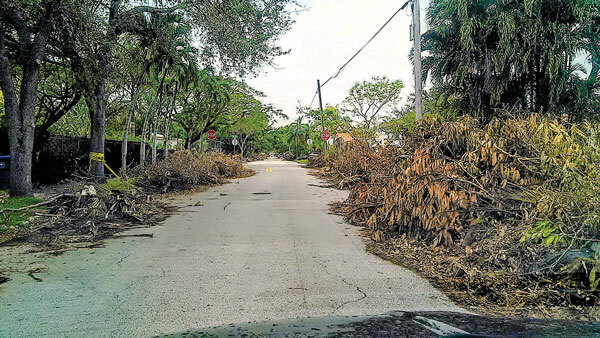 About eight months or so since Irma’s wrath and city officials have filled in all of the necessary forms, with “i”s dotted and “t”s crossed, the reams of bureaucratic paperwork have been readied for submission in order to secure vital reimbursement funds. City commissioners are to consider a vote on a request for reimbursements today (5/24). The commission is asked, by a four-fifths vote, to approve the necessary submissions by the city manager, finance director, budget director, departments and officials of requests for Hurricane Irma cost reimbursements from US Department of Homeland Security (DHS) Federal Emergency Management Agency, and the State of Florida Division of Emergency Management. The resolution would establish a special revenue project entitled “Hurricane Irma Federally Funded Sub Awards and Grants Fiscal Year 2017-2018,” appropriating funds for the reimbursements of city funds expended in connection with the hurricane, currently estimated at $34,193,228. Reimbursements from insurance proceeds based on claimed locations are estimated to total $9,429,373. As Hurricane Irma approached the state, the governor declared a state of emergency on Sept. 4, and on Sept. 8 the city’s mayor declared a state of emergency. The resolution says that before, during and after Irma, the city manager, finance director, budget director, procurement director and others undertook steps necessary under emergency circumstances to submit Hurricane Irma costs and expenses for reimbursement to FEMA and for insurance proceed awards. The US Department of Homeland Security through FEMA is authorized to provide funds to local governments directly through grants, and to states for subsequent distribution to local governments through sub-awards, to address the eligible reimbursable costs and expenses of natural disasters in emergencies, and to mitigate against future natural disasters. The federal government is expected to reimburse up to 90% of debris removal costs, while other costs are reimbursed at 75%. 1. Alice Wainwright Park, 2845 Brickell Ave.
2. Armbrister Park, 4000 Grand Ave.
3. Bayfront Park and Museum Park, 301 N Biscayne Blvd. 4. Charles Hadley Park, 1350 NW 50th St.
6. Curtis Park and Boat Ramp, 1901 NW 24th Ave.
8. Douglas Park, 2755 SW 37th Ave.
9. Fire Training College, 3425 Jefferson St.
11. Jose Marti Park, 351 SW Fourth Ave.
12. Little Haiti Cultural Center, 212 NE 59th Terr. 14. Moore Park and Tennis Center, 765 NW 36th St.
15. Morningside Park, 750 NE 55th Terr. 16. Museum Park, 1075 Biscayne Blvd. 18. Regatta Park, 2699 SW 27th Ave.
19. Shenandoah Park, 1800 SW 21st Ave.
21. Virginia Key Beach, 1820 Arthur Lamb Road Drive. About half of the 600 slips are unusable which represents a loss of revenue of close to $3M so far. Temporary caution tape put up after the storm is still flapping in the breeze, all faded out. Duct tape and garbage bags used to cover broken dock lights are now disintegrating from months of UV exposure. Why isn’t Dinner Key Marina listed. It is a city owned marina that was damaged badly from hurricane Irma.